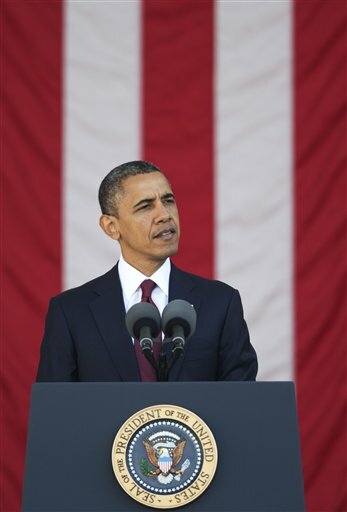 Obama and coal: Does the mining industry not understand who won the presidential election? November 13, 2012 by Ken Ward Jr.
Kentucky Coal Association President Bill Bissett said voters wanted to send a message to Obama. It is our hope that this message was heard by the president and that perhaps he changes his position. Am I the only one having a hard time understanding what Bill Bissett is talking about here? Bill is focused — like the AP story he’s quoted in — on just one House of Representatives race in Kentucky, to the exclusion of everything else that happened last Tuesday when the nation went to the polls. We’ve already mentioned here on Coal Tattoo and in the Gazette print edition that the mining industry’s “War on Coal” candidates lost six key Senate races around the country. You don’t hear the industry and its publicists saying much about those races now. What else do the election returns tell us about the coal country vote? Well, it’s certainly true that if you look at the map and at coal production figures, Republican Mitt Romney did well in states that mine a lot of coal. He carried the vote in 18 of the nation’s 25 coal-producing states, including Wyoming, West Virginia and Kentucky, the big 3 that account for roughly 62 percent of the nation’s 2011 coal production. And across the board, Gov. Romney got 154 electoral votes — about two-thirds of his total — from coal-producing states. But if you look more closely, the picture is more mixed. Take the nation’s top dozen coal-producing states: Wyoming, West Virginia, Kentucky, Pennsylvania, Montana, Texas, Indiana, Illinois, North Dakota, Ohio, Colorado, and Virginia. Last year, those 12 states accounted for 92 percent of all U.S. coal production. Five of them — Pennsylvania, Illinois, Ohio, Colorado, and Virginia — went for President Obama. That’s a total of 80 electoral votes right there. Compare that to Gov. 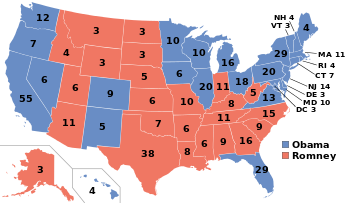 Romney’s victories in seven of the top dozen coal states, and he gathered 71 electoral votes. And more than half of those came with the 38 electoral votes he got from Texas. While the coal issue drove higher Republican voter turnout and percentages in Virginia coal country, it wasn’t nearly enough to change Tuesday’s election outcome in the state. According to unofficial vote totals released by the Virginia State Board of Elections after midnight, President Barack Obama had won the state with 50 percent of the vote to challenger Mitt Romney’s 48 percent. Virginia, a swing state that wasn’t called until hours after Obama’s victory was announced, had faced a constant bombardment from both sides with ads and campaign events. The large but largely rural region of Southwest Virginia, which relies on coal mining as a key economic driver, had received a lot of attention from the Romney-Ryan campaign with visits in the weeks leading up to the election. The strategy, supporters said, was to drive higher turnout in areas with strong support, in hopes of bringing swing state Virginia back to the Republican side of the election equation this year. But it wasn’t enough. The 2012 elections drove home trends that have been embedded in the fine print of birth and death rates, immigration statistics and census charts for years. America is rapidly getting more diverse, and, more gradually, so is its electorate. Nonwhites made up 28 percent of the electorate this year, compared with 20 percent in 2000. Much of that growth is coming from Hispanics. The trend has worked to the advantage of President Barack Obama two elections in a row now and is not lost on Republicans poring over the details of Tuesday’s results. What we’re seeing is that everyone is in the reality creation business — for themselves. They cluster in like-minded groups because it helps the process. Meanwhile, places become increasingly unlike other places. Incomes diverge. So do educational levels. Suicide rates. Longevity. Attitudes. Political preferences. Regional accents are increasing. Where soldiers come from. People don’t know the coalfields. They have no connection. And in every way, their communities are becoming more different from Eastern Kentucky or Southern West Virginia. Coal industry officials have tried all manner of advertising campaigns to get the general American public to support coal by reminding them a large chunk of their electricity comes from coal-fired power plants. But the connection to coal just isn’t the same as when many homes and businesses burned coal themselves to keep warm — and the connection will become even harder to make as coal’s share of the electricity market continues to decline. So let’s face it: The coalfields — at least as they were embodied in American politics this cycle by the “War on Coal” campaign — lost the election. But you wouldn’t know it by the way coalfield political leaders and the mining industry are reacting. Despite a scathing campaign that pilloried him for waging a “war on coal,” industry and government officials say they are guardedly hopeful that President Obama is ready take a more lenient approach after winning a second term. Kentucky, the third largest coal-producing state, produced a 61 percent to 38 percent win for Repbulican candidate Mitt Romney, who promised to loosen environmental regulations in an industry that faces new and stiff competition from cheaper natural gas. So, if I understand this all correctly, the coal industry waged a vicious — and false — negative campaign alleging that the coal industry was being destroyed by President Obama and the U.S. Environmental Protection Agency, and now that these tactics didn’t work, the coal industry thinks that the president should come meet with them and reverse his policies? Or at least, as Sen. Joe Manchin suggested, President Obama needs to embark on a “healing tour” of the nation, starting with West Virginia, where Sen. Manchin won his Senate seat in part by blasting the Obama “War on Coal” and in part by sending the message that public policy disagreements should be settled with guns? Isn’t this just continuing the industry’s divorced-from-reality mindset that would ignore climate change, the negative impacts of mining coal on miners and the communities where they live, and the huge hidden costs of burning coal on public health? Wouldn’t an approach that would be more likely to succeed be to admit failure — to acknowledge that the industry lost, and to offer to come to the table and hear out not just President Obama, but coalfield residents who worry about their health, mine workers who don’t want to get blown up or die of black lung, scientists who warn that coal’s a major player in driving the devastating impacts of climate change, and experts who project that Central Appalachia coal’s in for a huge decline in coming years? It will be interesting to see what United Mine Workers of American President Cecil Roberts eventually says about the election results, beyond his short statement congratulating President Obama and Vice President Biden and noting that “they laid out a vision for America’s future that the majority of our fellow citizens believe is the right path for our nation.” The UMWA and Roberts have tried to begin providing their members with better information about what’s causing coal’s decline, but as we’ve discussed here before, the union walks a tightrope on these issues, so much so that they declined to endorse a candidate in the presidential race. What approach will Cecil Roberts take now to advance the interests of his union’s members and the communities where they work and live? Environmental groups are certainly making it well known that their side, so to speak, won the election. They’re calling President Obama’s re-election a mandate for action on all variety of energy issues like climate change and mountaintop removal. Truth be told, though, the president’s agenda for tougher regulation of coal has always been much more moderate than it’s been depicted, and his plans for moving forward on these issues are anything but clear. But in wondering if they can turn an electoral defeat into a policy victory, coal company officials — and especially coal miners — might do well to note that only one of the major environmental groups, the Sierra Club, is talking at all about helping coalfield economies in the wake of President Obama’s re-election. Do miners and their advocates want to find common ground on facing the future, just keep fighting to maintain the status quo, or engage in silly exercises like petitioning to secede from the union? If the coal industry has good arguments and sound ideas about dealing with the many challenges facing the coalfields, they can win the day without saying someone has “declared war” on them. Good policy arguments can win out if the discussion is fair and reasoned. Government and industry projections don’t suggest that coal is going away anytime soon, so isn’t it time for the policy debate to stop being driven by slogans about that sort of result, and focus instead on reducing coal’s very real impacts on people and the planet? If Romney had won the election, would Ken Ward have ceased his incessant non-stop ranting about all of this? Then why does Ken Ward expect others to exhibit behavior that he himself would not abide by? Interesting, if Romney had won the election he would have very quickly become the new scapegoat for the “war on coal” lobby. Very much like Inspector has made Ward. i had hoped that the cognitive dissonance inherent in the “war on coal” rhetoric, as well as the rest of the social conservative PR machine message, might finally destroy itself. the rapidity with which citizens began organizing petitions for secession suggests that I was wrong, that the republican machine is still stuck between steps 2 and 3 of the grieving process and that we are likely to hear more of this sort of rhetoric before it finally dies of attrition. The truth hurts, doesn’t it, Inspector? If you don’t like it, stick to FoxNews and don’t read Coal Tattoo! This is the second time that I have seen discussion about the top 25 coal producing counties. For the record, Gunnison County, CO, should not be considered coal country. It is a county full of environmentalists, hippies, and skiers. Minor point of discussion. A more relevant view of the coal country in this area would be Delta County, CO (which Obama lost). Well-researched, thoughtful and fascinating. I cannot tell you how much your work is appreciated. Both of my grandfathers mined coal in West Virginia, and I can only imagine how they would react to the quaint notion that mine owners as a group might love the splendor of the mountains or cherish its people. I won’t claim your expertise in the demographics of Colorado, but if you’re going to make sweeping statements about that issue, please follow the Coal Tattoo rules and provide some evidence, such as a link or citation to published material with demographic statistics. Delta County — 2.2 million tons of coal produced and 330 miners employed. It’s also true, though, that looking at MSHA county-by-county coal production is not an exact measure … it doesn’t take into account, for example, counties along the Ohio River that may have no coal production, but may have coal-fired power plants. And there’s no guarantee that miners who produce coal in one county live and vote in that county. I’m happy to have someone point out a more specific data point or data points that would be useful to look at here, if they can leave the snide remarks about “hippies” out of their post. Interestingly, there are five counties in Colorado that list coal production of more than 1 million tons. Obama won two of them: Gunnison and Routt. Romney won the other three: Moffat, Delta and Rio Blanco. Romney’s margins were higher in Moffat and Rio Blanco counties than they were in Delta. Overall in those top five coal-producing counties in Colorado, the vote was 26,522 for Romney and 18,346 for Obama. Two points: First, the coal mining industry itself has probably eliminated more jobs through mechanization and other mining techniques than any environmental or safety regulations have. Less miners = less people voting on mining issues. Second, the coal lobby has failed to push the utility industry to build new more efficient coal plants to replace the aging plants currently (not) operating. I know of only two plants in the region (Longview and Virginia City) that have come online in the last few years. Old plants are inefficient and burn more coal (and create more ash) to achieve the same electrical production as these new plants do and are thus less cost effective (and more expensive) to operate. It’s like trying to run a 1969 Plymouth Satellite station wagon with today’s gas prices and paying huge repair bills for antiquated auto parts. I have heard that comment before about building new coal plants and you need to know more about the electric utility industry before you can make a claim like that. First, electric utility companies can only build new coal plants when the state regulators allow them to recover the costs of the new plant through an increase in their electric rates. That is not likely to happen as long as an old plant is still capac=ble of generating electricity. Secondly, as was the case with the new $1.7 billion Turk Plant in Arkansas (currently in start-up), even a new plant with all the environmental controls faces years of legal challenges and over $100 million in legal expenses to fight against environmental groups like the Sierra Club challenging their permits. So, don’t blame the utility companies for not building new coal plants. It is just too big a risk for any company to take on. Same with Nukes. So called “renew-ables” cannot produce on demand and natural gas is way behind coal in BTU rating. The President’s prediction will come true. Electricity rates will skyrocket, and that is bad news for the poor who are having a time of it already. The State will badly miss the shrinking economic advantages the coal industry has provided its citizens for many years. But the lost advantages can be replaced by a severance tax on natural gas production. Moreover, the tax could be used for paying laid off miners severance pay and job retraining. Wouldn’t promoting this tax be more productive, job satisfying, and in the Gazette’s best interest than continually beating a dying horse? unbiased2 is apparently not a long time reader of Coal Tattoo. He makes exactly the point that Mr. Ward has been making here for the last several years. First, though, as Mr. Ward has been advocating, WV politicians have to face facts that have been apparent for a long time: there is permanent change in the WV coal industry. As long as they continue to insist that the problem is the EPA or Obama, our political leaders will continue to promote the false hope that “coal will be back” and that we don’t have to provide any support to laid off coal miners. I guess unbiased2 also missed Mr. Ward’s advocacy of a long term investment fund, funded by WV severance taxes, that could be used directly to help people dislocated by changes in the state economy. Despite unbiased2’s reference, the coal industry in WV is not a “dying horse.” There is an overall shift away from coal in electrical generation, and the coal resource in the Appalachian basin is severely depleted, but the coal industry is hardly “dying.” Coal will be mined in WV for a long time yet. The conduct of the coal industry in now making demands of President Obama as if it had won, and not badly lost the election is only a subset of overall Republican behavior. Telling the President what he “must” do with his victory is something Speaker Boehner and Senate Minority Leader McConnell have also done. Such bravado on its face may appear at least bold, but the underlying reality may be that the coal industry knew all along that the President’s coal policies weren’t nearly as drastic as they were portraying them to be, just as Boener, Cantor, McConnell, et al. know that Obama is far more a center-rightist compromise-seeker than the wild-eyed Bolshevik bette noir created by their marketing departments. One wonders how Senator Manchin would feel if, on that proposed “Healing Tour” he claims to want! President Obama stopped for a visit at either Maria Gunnoe’s or Bo Webb’s homes under the looming shadow of a mountaintop removal operation. Does Senator Manchin REALLY want the President to see Mountainop Removal up-close, personal and inescapable, the way thousands of Appalachian people have to live with it? Would the Secret Service even allow the President to be in proximity to the myriad poisons that daily flow and blow off such sites? I suspect that there’s only one sort of “healing” Senator Manchin wants, and it has absolutely nothing to do with healing the many health-related woes that afflict people who suffer and die in Mountaintop Removal communities; nothing to do with the ever-growing body of evidence pointing to a relationship between a host of health problems in MTR communities that Senator Manchin can scarcely bear to even acknowledge. Why not create new jobs here for our miners by taking all these surface mined sites and building solar farms and smart grids? You miss the point, Bill. The coal severance tax revenue will shrink as production shrinks. A new or greater severance tax on natural gas could offset the coal revenue loss to “keep us even” in total severance revenue plus give laid off coal miners severance pay plus retraining. How much attention do people pay to political leaders? But none I know of have said or even alluded that “we don’t have to provide any support to laid off coal miners” because coal production will come back. By now it is common knowledge WV coal production will never reach the pre-2011 level due to Marcellus gas production. Yes, I’m well aware of Mr. Ward’s very occasional advocacy, a no brainer. But such use would take away from other needed, worthwhile projects. I don’t think I missed any point. The problem is that for the past five years WV’s political leaders (including Democrats) have been pandering to the war on coal national Republicans who are trying to pry WV away from the Democratic Party. These politicians should have instituted required programs when the reality of future coal trends began to be come apparent. Severance taxes come from a number of sources in WV, not just coal. There is only one source of these taxes which is sustainable, if done right, and that is timber. But what did the WV Legislature do a few years ago? They cut the severance tax on timber. Natural resource production is by its nature cyclical. To some extent, the mix of resources smooths tax revenue out, so it is important to keep taxes at the same level for all resources so that this smoothing can operate. A lot of the Marcellus production in WV has already happened. Instead of increasing the severance tax on gas at the beginning of the boom, WV politicians spent most of their time repeating the industry’s “game changer” propaganda.